Recently, I changed my blog's theme and few days ago after changing it, I found that there are only 3 posts visible on my homepage where as I selected 8 posts to appear in the main page under blogger settings. I started working on this issue and after the long time, I finally understood what the problem really was. There was a simple technique to be used in every single post you create. You just need to insert the Jump Break in each of your post. 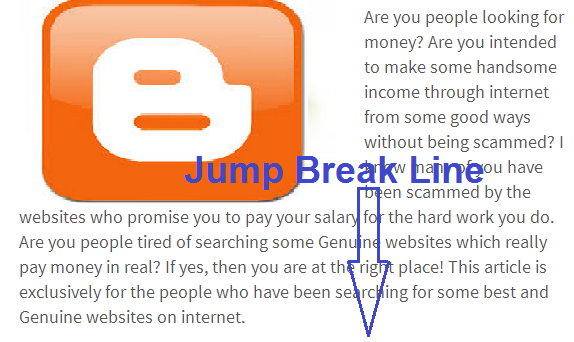 Did you Insert the Jump Break in any of your posts before? If yes, then you should insert the jump break in all other available posts. Follow these steps to insert the jump break line in your posts. Select "posts" from your blogger homepage. Click the link to open your post. Put the cursor under your first paragraph and select the "Jump Break" icon from the tools menu option. Follow these steps for your each and every posts manually, and you're done ! You can now see the number of posts you selected in the blogger settings on your blog main page. Hope my article clear and understandable. Good luck.